The latest designs for the redevelopment of Twerton High Street and Bath City FC’s home ground are to go on show. Following more than a year of community and stakeholder engagement members of the public are being invited to view the latest designs for the scheme, which could see the shopping area of Twerton transformed into a new thriving focal point for the community. If approved by Bath and North East Somerset Council, the multi-million pound investment will include new shops, a refurbished High Street and improved public space. The scheme will also bring new and improved facilities to Twerton including a new community hub, a gym, an all-weather 3G pitch and a new grandstand for Bath City FC. Purpose Built Student Accommodation, Affordable Housing for local people and co-living apartments for keyworkers and young professionals in the city are also part of the proposals. The Club is committed to ensuring the development project will help encourage healthier and active lifestyles, create more opportunities for participation in sport and increase social inclusion across different ages and groups in the Twerton community. The whole regeneration and provision of new facilities for both Bath City FC and the local community is only possible by the inclusion of Purpose Built Student Housing in the scheme. Wednesday 20th February, from 2pm to 8pm 115a High Street, Twerton, BA2 1DB. Saturday 23rd February, from 12pm to 3pm (before kick-off at the home game with Slough Town) in Charlie’s Bar at Twerton Park. Bath City FC announced in 2017 it was working with Greenacre Capital on a joint scheme to redevelop Twerton High Street, land to the rear of the High Street and part of Twerton Park. 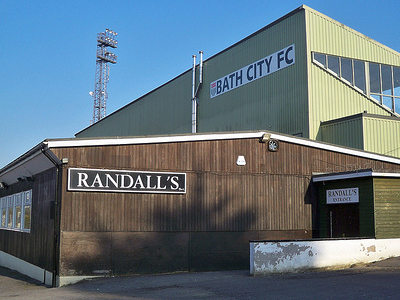 The redevelopment will help secure the Club’s financial future, keep Bath City FC in Twerton, as well as delivering real benefits for the surrounding community. Bath City FC and Greenacre Capital will submit a planning application to Bath and North East Somerset Council shortly. Once this application has been registered it will be available to view in full via www.bathnes.gov.uk where members of the public will be able to leave feedback.